What Is The One Sole Project? What Is The "One Sole Project"
The "One Sole Project" is the mission of Austin, Texas based fitness company, BlueSky Fitness, to unite the World, empower others, and bring out the best of the human spirit. 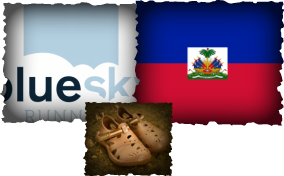 In 2015, with each fitness program BlueSky sold, we donated one pair of shoes to the St. Etienne School in Haiti. St. Etienne is the sister school of Austin, Texas based school, St. Stephens Episcopal. Our goal was to provide each individual within the school, students and faculty, with a pair of shoes. This comes out to 250 pairs of shoes. We accomplished our goal in 2015 and brought over 300 pairs to St. Etienne! In the future, we are looking into different ways to help others across the World and possibly expand our reach to other schools once we have a sound system in place to do so. This expansion of reach includes plans to help provide access to clean water in addition to shoes. All plans are in the developmental stage until further notice. Our motivation behind providing shoes stems from BlueSky Founder, Lorin Wilson being a long distance runner growing up. It was during Lorin's time distance running and coaching others in distance running he realized how powerful a pair of shoes can be in empowering us and allowing us the freedom to explore. We explore not just new physical paths with our shoes, but the depths of our limitations. Exercise is vital to fulfill the human spirit. Where poverty is pervasive it is common for people to have too walk many miles a day. The ground these people walk on is rough and full of different parasites. Without shoes they are more susceptible to injury or disease which can be lethal. The simple act of walking, jogging, and exploring should not be fatal because of something so simple such as shoes. A pair of shoes can make one's day to day life more comfortable which will lead to other advancements in quality of life such as education and economic development. Every year over one million children die from preventable diseases caused by the lack of proper shoes. The right shoes protect unfortunate children against soil parasites, cuts, abrasions, infections and disease. An estimated 2 billion people are currently afflicted with parasitic diseases, most preventable with the right shoes. Millions of children are not allowed to attend school without proper footwear, resulting in the continued cycle of abject poverty generation after generation in developing countries. BlueSky Fitness was founded with a mission to empower others. To help fulfill the human spirit. BlueSky gives back to our local communities as well as the World. BlueSky believes each individual deserves to be loved. We believe every person has a great gift. Their gift is their own personal artwork to be given to the World. Shoes will help them develop and give this gift through allowing them to exercise, play, travel, as well as attend school in a safe manner.